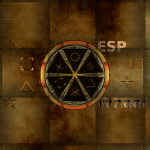 ESP Wheel is a casual game for Android. The player tests their ability to guess the next symbol that the wheel will highlight. You receive 'hit' points when you guess correctly or 'miss' points otherwise. Your score is continuously saved. - Mended: Able to tap buttons while the wheel is rotating. - Mended: Buttons need to be more button-like. - Mended: Splash Screen needs to be full screen on all devices. to guess the next symbol that the wheel will highlight. otherwise. Your score is continuously saved.